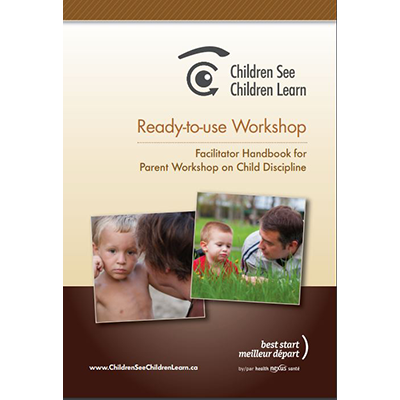 This ready-to-use workshop has been developed for service providers who work with parents of children from birth to age 6. It provides service providers what they need to deliver a workshop to a group of parents on the topic of child discipline. This resource can also be used on a one-on-one basis, through home visits or in clinical settings. It is based on the website Children See. Children Learn. A good complement to this resource are the FAQs about time-outs, available in English and French. short videos, available for free on the Children See. Children Learn website, or available for purchase on this page (scroll up). a facilitator guide in a PDF format, downloadable for free from this page (scroll up). All these materials are also available in French.